So we were walking home this lovely afternoon and as we came to the intersection of Durant and Telegraph Avenues, were pleasantly surprised to discover this! Playing a catchy tune on his upright piano and joined by an enthusiastic vocalist, Dotan Negrin graced the streets of Berkeley in his quest to travel the country, inspiring people with his vision and his music. The poster on his piano featured a map of the good ol’ U. S. of A. and the address for his homepage, which we visited immediately upon reaching the comfort of our wi-fi. From the many photos Negrin put up online, it appears that he’s played in Grand Canyon National Park, Las Vegas, Zion National Park, New York, various spots around San Francisco and now he’s come here. I believe what you said was actually very reasonable. But, what about this? suppose you were to create a killer headline? I mean, I don’t want to tell you how to run your website, but what if you added something that makes people desire more? 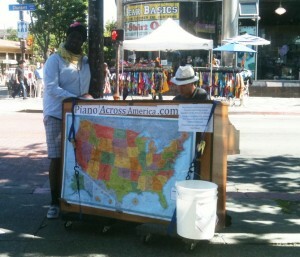 I mean The Daily Clog » We Spy: Piano Man Hits the Streets is a little plain. You ought to look at Yahoo’s front page and see how they create post headlines to get people interested. You might try adding a video or a pic or two to grab people interested about everything’ve written. In my opinion, it might bring your posts a little bit more interesting. omg went through many sites but still couldn’t find an article that will answer my questions. glad i found your site. thank you very much. if you need me to update this info, i would like to share with you, just email me. Pretty section of content. I just stumbled upon your website and in accession capital to assert that I acquire actually enjoyed account your blog posts. Any way I will be subscribing to your augment and even I achievement you access consistently fast. I appreciate a tremendous publish, would examine one’s others topics. thanks for your thinking for this, I really felt somewhat thump by this post. Many thanks again! You earn an excellent aspect. Has fantastic info here. I do think that in case more people thought about it like this, they’d have got a better time period obtain the grasp ofing the issue. greate content , good writing skills , how any one can’t post the comment. Hey there! This is my first visit to your blog! We are a group of volunteers and starting a new project in a community in the same niche. Your blog provided us useful information to work on. You have done a outstanding job! Hiya, I’m really glad I’ve found this info. Nowadays bloggers publish just about gossips and internet and this is actually frustrating. A good blog with interesting content, this is what I need. Thanks for keeping this website, I will be visiting it. Do you do newsletters? Cant find it. Howdy! This is my 1st comment here so I just wanted to give a quick shout out and tell you I really enjoy reading through your blog posts. Can you suggest any other blogs/websites/forums that cover the same topics? Thanks a lot!